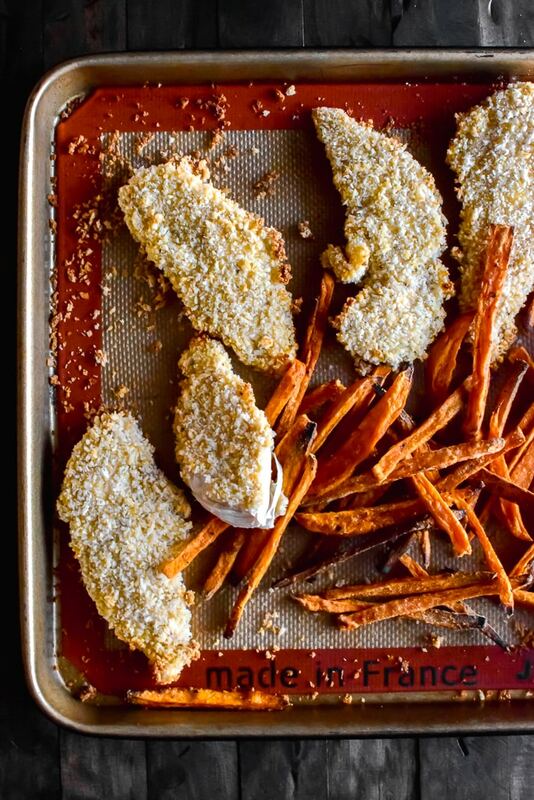 Extra crispy chicken fingers that are baked, not fried and incredibly simple! I don’t get too creative with dinner that often during the week. I need quick recipes that fill me up with minimal clean up — a giant sweet potato topped with shredded chicken and vegetables is a good meal for me. Or even that ginormous salad from Panera. Or a bucket of guac. Any of those work. But my favorite dinner? Something that I could eat forever and never get tired of it? Chicken fingers. I’m a huge sucker. Who doesn’t love eating with their hands? 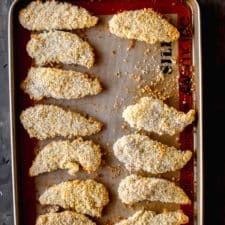 I made these chicken fingers quite a bit last summer because they are on the healthier side and simple. Plus, these are the best chopped up and tossed in a homemade salad. Our Butcher Box subscription just arrived so we’re stocked on chicken tenders for the next month. Looks like a variety of chicken fingers will be on the menu a lot this month. These are so darn good even without the fryer! Let’s talk about the recipe for a second. There’s no marinating — yes! This recipe a quick 15 minutes to prep and then let the oven do all the work! While the chicken fingers are baking, toss in some fries or cook up your favorite vegetable. Either way, you have a complete meal in 30-40 minutes tops. Oh, and the second I finished this photoshoot, I downed these in about 2 minutes. I don’t even think I took a breath of air. No shame in my chicken finger game. nonstick spray like ghee, coconut oil, etc. Preheat the oven to 425°F. Line a large baking sheet with a silicone baking mat or with parchment paper. Combine the flour, paprika, salt, and pepper in a shallow dish. Beat the eggs in another shallow dish. And, pour the Panko breadcrumbs into a third shallow dish. For this, I love to use pie dishes. 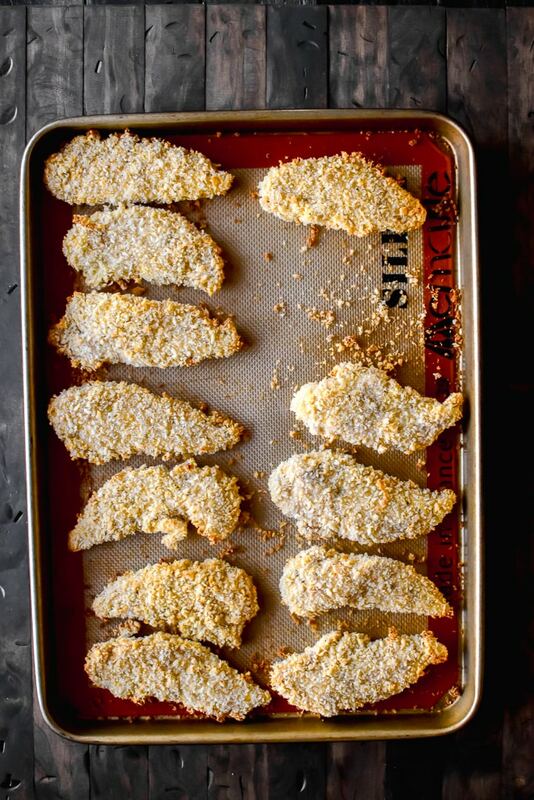 Coat each chicken tender in flour, shaking off any excess. Then, dip into the egg and allow the excess to drip off. Then, generously roll in the breadcrumbs, slightly pressing down to make sure the breadcrumbs adhere to the chicken, shaking off any excess. Place the chicken on the prepared baking sheet. Spray each with nonstick spray - I prefer to use ghee for this. Serve chicken fingers with ketchup, honey mustard, BBQ sauce, etc. Store leftovers in the refrigerator for 2-3 days. 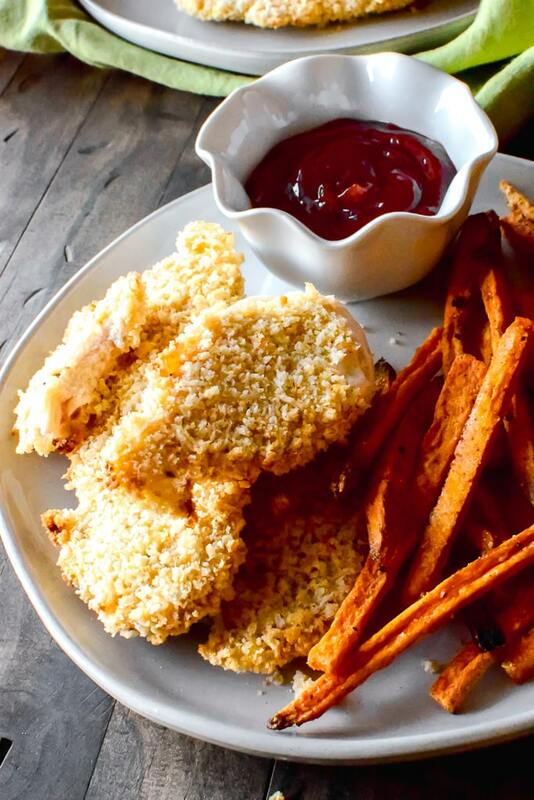 Make ahead: Cooked chicken fingers freeze well for up to 2 months. Bake frozen for about 18 minutes, flipping once, at 350°F. Previous Post: « Blueberry Walnut Crumb Cake. These look so good! Great post! Love the visuals!